Wow. Wow. Wow! This is a phenomenal novel; it’s an absolutely amazing, glued to my seat, wonderful, can’t get enough, kind of read. But that cover? Oh. God. Someone please tell me they’re going to change that cover. Truth: it’s hideous. And, it doesn’t make me want to read the novel. You can put a synopsis in front of me, and it might be the best synopsis in the world, but if the cover stinks, I’m only going to do a cursory glance before I move on. Not pick it up, not fall in love with it, just pass it over. Let’s be honest: we shouldn’t judge a book by its cover. Ever. Nope. But we do. It’s human nature. If I’m in a bookstore with thousands of books to choose from, what book is going to stop me and get me to pick it up to read the synopsis? One with a magnificent cover. This book, unfortunately, is not it. I would pass it by in a heartbeat, and so would my students in book club… I showed them a picture and they vetoed the novel before I even told them what it’s about!!! They thought it was about bees and being stung. Which, I guess in a way it is, but… it’s soooooooo much better than that. So, to the powers that be, please do the author justice and change the cover so more copies of this magnificent story fly off the shelves and are eaten up by readers. Seriously. Okay, rant ended. I absolutely adored this spectacular novel. 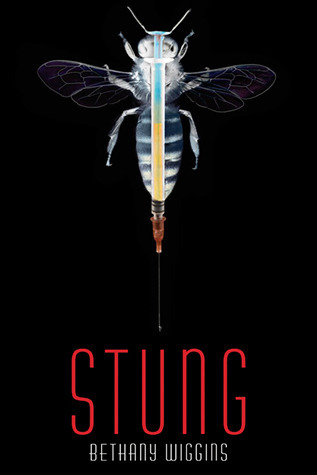 As you can probably tell from the above rant, I wasn’t expecting much going in, but I received a free copy of Stung at NCTE this past November, so I thought I’d give it a whirl. And boy, was I glad I did! The fight or flight mantra throughout the entire novel kept me on my toes, especially as the story unfolded and it became apparent that Fiona and Bowen were in so much more danger than I originally thought. And the characterization? Well, Fiona is a great character! I loved her struggle with her memory loss, and the mystery surrounding her was intense and fascinating! But Fiona isn’t the only character I enjoyed; I loved them all! I highly enjoyed getting to know every single one, from the creepy sewer dweller to the militia men, these characters are awesome, well fleshed out, vivid, and real! And as events unfolded, the sincere fear and stress I felt for the characters put my heart in my throat—I couldn’t put it down, and I just love that this entire novel, from start to finish, is shrouded in mystery. As the reader, we don’t know why Fiona has the mark, why she’s sane and others with the mark are not, why she woke up four years older than when she went to sleep, or why she has a connection to Bowen from the very beginning. But as the story fleshes out, we’re given glimpses into the past, which helps us connect the dots leading up to the grand finale that had me whooping for joy. This is just a great read all around, and I loved that it kept me guessing throughout. I wasn’t expecting the reveals Wiggins provided, and I really liked them; the answers made sense in this not so distant future world, and as the puzzle pieces came together, the novel continued to blow me away. This is a must read. Five stars. Bloomsbury USA Children’s Books has been extremely gracious in giving me an ARC of this novel for review prior to its release on April 2, 2013. Your review made me want to read this. I like books that can keep readers on the edge of their seats and I love books that have amazing main character/s. The fact that you enjoyed reading about ALL the characters makes this one a must have! I just saw that the ebook is ONLY $2.99 on Amazon!!! I nearly died. Grab it if you have a Kindle, it’s so worth the read and the price is GREAT!!! I actually like the cover for this. It was the only one that stood out to me and it made me think that it might have been about drugs and weird stuff rather than it being about bees. The others kind of all just look like generic YA covers to me. This book sounds great, and I totally agree with you on the cover issue – I’m reading Throne of Glass right now, and I think the cover is sooooo lame!